Source: CICH graphic created using data adapted from Canadian Mortgage and Housing Corporation (CMHC). Canadian Housing Observer. 2014. https://www.cmhc-schl.gc.ca/odpub/pdf/68189.pdf – accessed March 20, 2017. 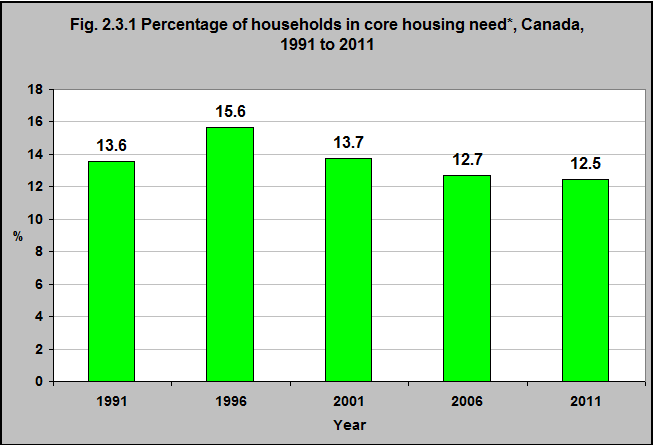 In 2011, 12.5% of Canadian households were in core housing need*. That was down from 15.6% in 19961. Nearly half of homes in Canada are occupied by renters – the median family income of renters is $37,100 compared with $74,540 among home owners. Nearly 50% of renters spend 30% or more of their income before tax on housing. That is less than 20% for home owners2. 1Canadian Mortgage and Housing Corporation (CMHC). Canadian Housing Observer. 2014. https://www.cmhc-schl.gc.ca/odpub/pdf/68189.pdf accessed March 20, 2017. 2Gaetz S, Gulliver T, & Richter T. The State of Homelessness in Canada 2014. The Canadian Observatory on Homelessness & The Homelessness Hub- http://homelesshub.ca/sites/default/files/SOHC2014.pdf accessed March 20, 2017.